You might think a ghost ship would be creepy and spooky. Perhaps some are, but ours isn't. 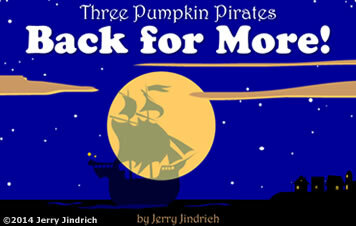 The Three Pumpkin Pirates sail around the world in a jolly ghost ship named Compass Rosie. 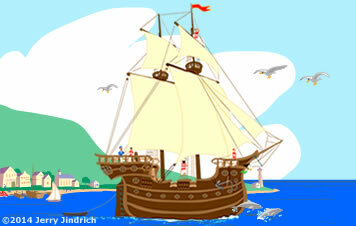 A whole section of Meddybemps.com is devoted to the Pirates and their ship. Click on links below to open new windows to enjoy these pages. 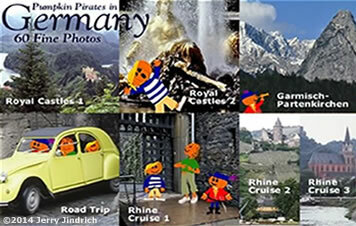 Compass Rosie first set sail from the port of Tiddlywinken on October 31, (Halloween) in 1502. 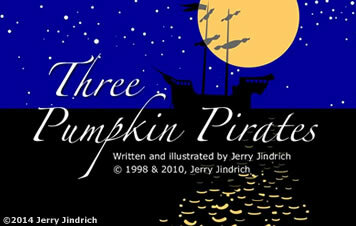 Learn how she became a ghost ship and meet the Three Pumpkin Pirates. Being a ghost ship, Compass Rosie is full of ghosts. These have a silly sense of humor and like to make mischief. Click on various parts of the ship to find the ghosts. To see a sample, move your mouse around this picture of the galley (kitchen) to make the ghosts appear. A search for buried treasure leads to sweet rewards. This is a story told in rhyme. It's a year later and the Pirates have returned. Their search for Halloween candy leads to a big mix-up at a halloween costume contest. The Three Pumpkin Pirates love to explore the world. Follow their adventures in Germany, Australia, and the state of Alaska in the U.S.A.
A compass is an instrument used on ships and boats. What does it do? Name the Three Pumpkin Pirates. The Pirates also like trains. Which can travel faster, a train or a pirate ship? � 2014 Jerry Jindrich. All rights reserved. Revised 1/25/2016.